Can you guys believe it’s already Memorial Day weekend? I am so thankful that summer is here! We spend a majority of our free time on the boat or at the beach in the summer months – a perk of be being sandwiched between the Chesapeake Bay and Atlantic Ocean. We also love to cook and enjoy meals outside when it’s warm, a tradition that the boys have loved. They’re always so excited to hear we’re going to have a “picnic dinner” in the backyard. One dish that I find myself making again and again over the summer is this classic potato salad. It’s old school, but it’s the perfect balance of textures and flavors. Starchy potatoes, hard boiled egg, celery, and crunchy onions tossed in a dressing made of mayo, Dijon, and celery seed. Then, for my signature twist I like to add a bit of Old Bay on the top. 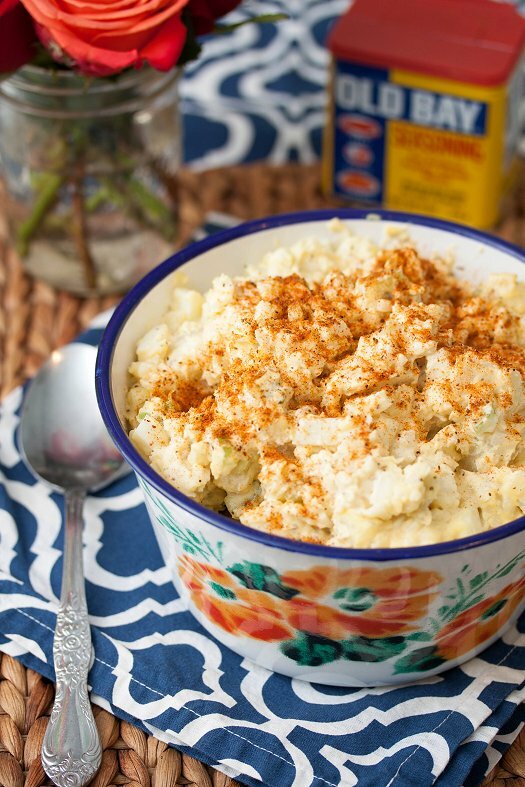 Honestly, that’s actually my mom’s signature twist – this is her potato salad. And, her mom’s potato salad. But, I’ve adopted it as my own. The seafood seasoning mixture kicks plain old paprika to the curb! Great to enjoy for a cookout, a potluck, a beach lunch, or a random picnic…anywhere, really. I love to enjoy leftovers for lunch as well. Try this one for your Memorial Day get together this year, and you won’t be sorry! Place the potatoes in a large pot and fill with cold water. Add 1 Tbsp of kosher salt, cover, and bring to a boil. Cook over medium-high heat until potatoes are easily pierced with a pairing knife, about 20 minutes. Once tender, drain potatoes and let sit in colander until cool enough to handle and chop into 1/2-inch chunks. Set aside. Hard boil the eggs by placing them in a pan of cold water. Bring to a boil. Once boiling remove from heat, cover, and let sit for 10 minutes. Drain out the hot water and soak in cold until the eggs are cool enough to peel. Peel, chop, and set aside. Make the dressing by combining the mayo, as well as the mustards, celery seed, and 1/2 tsp salt in the bottom of a large bowl. Add the cooked potatoes, eggs, onions, and celery. Gently toss to combine mixture evenly. Season to taste with salt. Place in serving bowl and sprinkle with Old Bay. Skip the mustards and use AC vinegar and a tablespoon or two of sugar instead. The best dressing is sweet and sour. Every time I take my potato salad to an event everyone wants to know who made it, its that good. I dislike sweet potato salads. Although, I do enjoy a good French potato salad made with less starch potatoes, a vinaigrette, and plenty of freshly chopped herbs. I agree with you about sweet potato salads and ditto on the French style! Your recipe looks amazing, and I love the addition of the Old Bay!